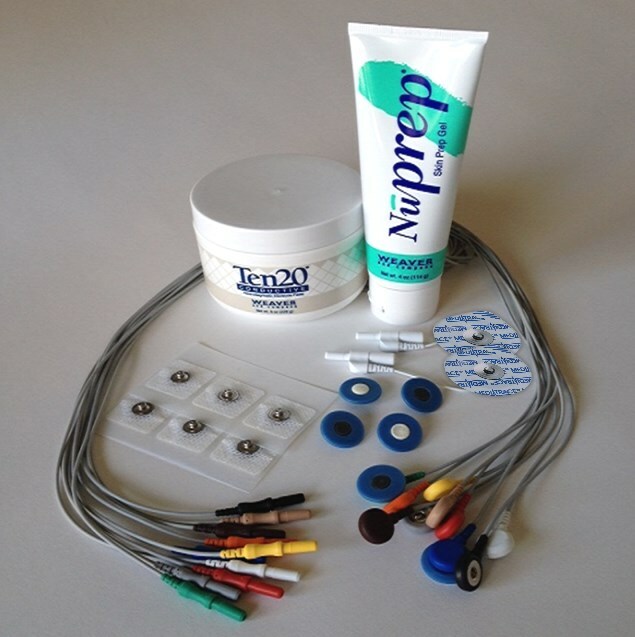 Cap and electrode EEG supplies for neurofeedback assessment and brain training. There are various caps, which use saline and standard electrodes. Our caps are made by Electro-Cap International, one of the two or three primary providers of these items in the world. There are a number of different standard or custom versions of their caps, depending on which sites you want included. All of them can be run through an adaptor board (extra cost), which allows you to plug the 25-pin plug from the data cable into the adaptor and then has a number of electrodes which are color-coded so you can plug the ones you want into standard DIN plugs. Using a cap with a unit like the Q-WIZ allows you to plug the cable directly to the amplifier and skip the electrodes entirely. But that requires that both the cap and the amplifier recognize which site’s signal is being brought through the cable on which pin in the plug. And, of course, that is not 100% standardized across all manufacturers and amplifiers. The cap for the Q-WIZ has the 20 sites used for the full TQ7 assessment, including Oz (but not Fpz) and they are mapped to the same wires in the connector in both the cap and the WIZ. That’s what allows you to record the full assessment in 15-20 minutes. You’d have to contact ECI to find out whether another amp using a 25-pin connector will work with that amplifier or not. Or you can run your cap through an adaptor board (designed for the cap) and plug the individual electrodes into the amplifier and change them manually. Our Electro-Cap has all the sites you need to do the full TQ7. In fact you just prep every site on the cap (AFz at the top of the forehead is the ground). Then you can use your WIZ with the WIZ window (as explained in the brain-trainer Wiz user’s manual on the page about gathering an assessment with the cap). The Electro-Cap allows you to set them up through the cap without additional electrodes, so you can hook up multiple sites in the beginning of the session and then just switch among them as you change what you are doing in the session. The electrogel is made specifically for use with the cap, designed to be injected into the little holes that give access to the electrode wells at each site. Gel is injected into the electrode wells on the cap which hold it in place; it soaks down through the hair. If the cap is on properly, the electrode reservoirs are held pressed against the scalp so the gel doesn’t “leak” out. Putting the needle in the hole and lightly swirling it (as shown in the video will sometimes help the gel reach the scalp. If you inject a little more, it should quickly come out the top of the hole. Generally if there is a problem with size, it’s that the cap is too large, allowing the gel to come out of the reservoirs and run across the head. You don’t need to remove the cap to work on a connection. Just inject a bit more gel and press down and slightly massage the electrode against the head. The syringe doesn’t come in contact with anything on the client’s body, so it should be no problem to reuse if you wash it well. I draw very hot water into it and squirt it all out 2-3 times until the plunger runs smoothly. You can certainly re-use the needles as well (you should probably boil them between sessions). The key is to remember that you are not to abrade the skin with them. You swirl them lightly to work through the hair down to the scalp. Then I raise it up slightly and hold it between index finger and thumb so when I press down the plunger on the syringe I’m not pushing the needle against the scalp. I can also feel the gel coming out the top of the hole immediately and stop pressing. Here in Brazil they sell something like an old-fashioned bottle brush, long with bristles on it, that’s meant to clean under orthodontic braces. It’s the perfect size to run through the holes. I’ve also used a soft toothbrush to clear the gel out of the reservoirs on the inside of the cap. I turn mine inside out so the reservoirs are accessible without pulling on the wires. After a light washing and cleaning of the channels and/or reservoirs, I run cool water over it to clear the soap. Because it’s made of the material it is, it tends to dry very quickly, though again, if you are in a very humid place without A/C, it might take longer. I wash at the end of the day and leave it sitting over the top of a gel jar (for example) still inside out, and it’s nearly always dry by morning. If it’s a problem occurring only at one site, you should have gotten a quick-connect electrode. Try plugging one of these into the Oz and then plugging into CH4 active and see what happens. If that solves the problem, then you probably have a bad electrode in the cap and it needs to be returned. The cap needs to be placed so the front Fp1 and Fp2 electrodes are well in the valley across the forehead. Then, when it is pulled up and back (ideally with the client holding those front electrodes in place, it is pulled tight down to the back. If you are doing this yourself, it’s a lot more difficult and injecting the gel into the Oz electrode on your own head is quite difficult (at least I have found it so). Are you using PASTE with the Electrocap? That could certainly be part of the problem you are having. I’m using mine 2-3 times on training days (and many of my supervisees here use it for 4 or 5 sessions a day). We clean at the end of the day–usually 5-8 minutes–and let it air dry overnight. I run a 2-3-second stream of very hot tap water into each electrode reservoir I’ve used, which clears out the gel. Then I blow sharply through the hole from the inside out. (A more dignified way of doing it is to get a small “bottle brush” used for cleaning dental braces, which runs though the hole perfectly). I clean the syringe and needle at the same time. By morning, everything is clean and dry and ready to go. Of our group of 35 trainers here, maybe 20 are using the cap now. Pretty much everyone’s response to it is the same as mine: It takes me maybe 5 minutes to set up a session with it, whether I’m training 4 or 12 sites, or assessing 20. There is nearly zero time to switch sites. The best part, though, is the quality and stability of the signals. Your experience with the first cap was unusual, but if you are having it again, it swings the needle more toward something you can change with technique. My folks here are often working with sequential clients using the same cap. They’ve developed an ingenious and inexpensive solution to hygiene concerns. They buy restaurant hair nets. Putting those over the client’s hair before putting on the cap doesn’t block the gel from reaching the skin at all. Injecting the gel takes some practice. I time myself (informally) when I’m doing this to see how fast I can get without a bad signal. If you are using a cap that’s too large, gel can escape from the reservoirs and you’ll see a signal problem. I’d love to see any of these you have recorded. The package includes a video class on how to find sites. Once you know where, for example, P4 is, it’s easy enough to find by touch. Most people don’t have a problem getting the blunted needle into the hole by touch once they know which hole, and they can feel the gel as it goes in. It takes a little practice to get fast, but it’s not rocket science. 1. Disposable electrodes. The lead wires are if not permanent, long-lasting. They end in a snap-on connector. The disposable electrodes snap in to the connector. The snap-in electrodes can have an adhesive strip attached or not. The adhesive ones will attach to bare skin and should not be used for sites where there is hair. 2. Standard non-disposable electrodes. These are a lead wire + electrode attached. About ear electrodes: The ear lobes are commonly used as reference sites because they are relatively neutral electrically. An alternative is to use the mastoid bone behind the ear. If you want to use the ear lobes you need ear clip electrodes. If you are using non-disposable electrodes, you get special ones that are lead wire + ear clip + electrode. If you are using disposable electrodes, you get special snap-in connectors that are ear clip + electrode. These snap into the lead wire. If you want to use the mastoid bone, you don’t need any special ear electrodes. Electrodes on head sites should use the blue snap-in Neurotrodes, clear the hair out of the way, prep the site lightly for 8-10 seconds, then place the electrode on the scalp and lightly “wiggle” it down, to flatten the paste and produce a thin layer of paste between the Neurotrode and the scalp. With the Neurotrodes, I get them get down to the silver as quickly as possible, then use them for a long time. It’s when they are bi-metallic that they create a battery effect and actually make a signal from the electrodes themselves. The quality of Grass, Nicolet, RochesterMed or other hospital-quality electrodes is such that you can use them for many sessions without a problem. Silver and tin electrodes are solid metal. ALL gold electrodes and gold-plated are, at heart, silver/silver-chloride. Many other brands of gold-plated electrodes I’ve seen lose their plating fairly quickly, and it is important that you do not use scratched, or bi-metallic electrodes, which create a “battery” effect. A gold electrode with a scratch on its surface can reveal the silver beneath the gold plating, thus becoming bi-metallic. Regardless of type of electrode, you should definitely replace any electrodes that start to discolor, get bent or rusty, or that have any nicks in the insulation wire. They will seriously degrade signal quality. The electrodes are the cheapest part of the system, and it’s a shame to use bad ones which essentially undercut the benefits of the best amplifiers and software. You’ll get a lot better signal if you use Nuprep or some other mildly abrasive prep and rub lightly for 8-12 seconds at each site before placing the electrodes. Alcohol may remove the oils on the skin, but it’s not likely to clean off the dead skin cells, etc. If electrodes are falling off, chances are you are using too little paste, you are leaving your paste jar open, so it is drying out, or you are using a poor paste. Here in Brazil there is a paste–the only one you can buy in the country–which is so dry that the electrodes barely stick to the head. If you are using Weaver Ten/20 conductive paste–the brand most used in the US–that should not let go so quickly. If you leave the paste jar open, the paste will dry out and lost both its conductivity and its holding power. After training, if you are using snap-in Neurotrodes, just wipe them off with a tissue or paper towel. If you have purchased cup electrodes, dunk them in hot–not quite boiling–water three or four quick dunks, and the paste melts away and leaves them clean. Don’t leave them soaking. Soaking is bad for the wire connection to the head. I’ve always understood that electrode manufacturers suggest that you clean the paste off immediately after training, as it tends to damage them. Leaving paste on the electrodes for a long time before the training literally ensures that it will be drier and less likely to “stick”. I’m not sure about the need to “disinfect” electrodes. If you are working in a situation where infection is a real possibility, then I’d suggest using a separate set for each client. You really can’t autoclave electrodes. Otherwise, use an alcohol prep or cotton ball with alcohol to wipe each down. This should certainly give you a clean electrode and one which is unlikely to transfer anything from one client to another. Impedance is always measured between two electrodes. All impedances should be below whatever level you have decided on (5 kohms was a standard for many years; now, with high input-impedance pre-amps on most devices) it appears that 10 or even 20 kohms are ok. All impedances should be pretty close to each other as well. This is perhaps more important than the specific levels. Once you have a quality connection with electrodes that are compatible with one another, I put aside the impedance meter, plug the electrodes into the Focus and start the session. Of course you generally don’t need an impedance meter with the Focus, because electrode or connection problems are usually quite obvious in the Oscilloscope and Spectrum Analyzer displays.